TNBC is the only type of breast cancer for which there are no currently approved targeted therapies. 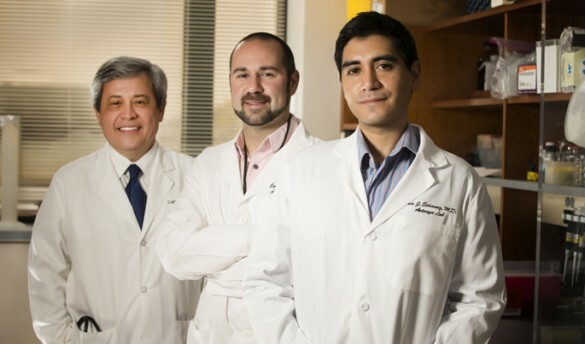 The new study led by Vanderbilt-Ingram Cancer Center (VICC) investigators has identified gene alterations that may explain why TNBC is resistant to most existing treatments, and suggests that a targeted therapy currently in clinical development may prove beneficial. The research, led by first authors Justin Balko, Ph.D., Pharm.D., and Luis Schwarz, M.D., was published online last week in Science Translational Medicine. While chemotherapy prior to surgery can eradicate TNBC in approximately 30 percent of patients, in other patients the cancer behaves in a manner resistant to chemotherapy and often spreads or metastasizes to distant sites in the body, at which point there is no proven cure. The JAK-STAT gene-signaling pathway, which is critical to cell growth and survival, drives the growth of many tumors, including breast cancer. Scientists have not been able to identify clearcut drivers for TNBC but there has been some evidence that the JAK2 gene may play a role. For this study the authors studied tumor samples from 111 patients treated at the Instituto Nacional de Enfermedades Neoplásicas (INEN), in Lima, Perú. After sequencing the tumor samples, the authors found that the JAK2 gene was more frequently amplified in chemotherapy-treated TNBC than in tumors before treatment. These patients with JAK2 gene-amplified tumors also had a recurrence of their cancer sooner and were more likely to die within 20 months following surgery. These findings suggested a potential causal role for JAK2 in drug resistance. The investigators also found that JAK2 increased in a limited number of patients where biopsies were collected at different times during treatment. The rate of JAK2 amplification in these tissues was similar to samples obtained after chemotherapy, suggesting that JAK2 plays a supporting role in drug resistance and cancer stem cell-like features. In cell lines, the researchers first tested ruxolitinib, a general JAK inhibitor, but it did not block tumor formation in the JAK2-amplified cells. The researchers then turned to a JAK2-specific inhibitor now known as BSK805 which markedly reduced TNBC tumor growth in mice when paired with chemotherapy. The findings suggest a role for JAK-2 inhibitors for these triple-negative breast cancers.